My best friend, Brad Bryant and I have talked about Caribou for ten years. 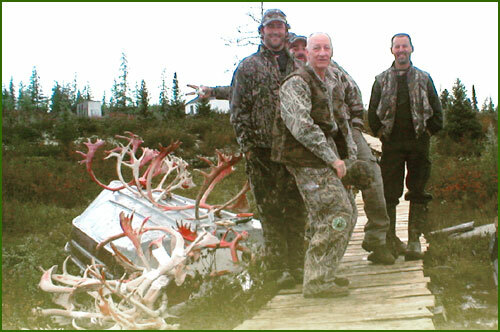 During a 2004 Wyoming Deer hunt we made a pact to book an arctic ‘bou’ hunt. Brad took the lead, searching outfitters, calling references and spending countless hours on the Internet. 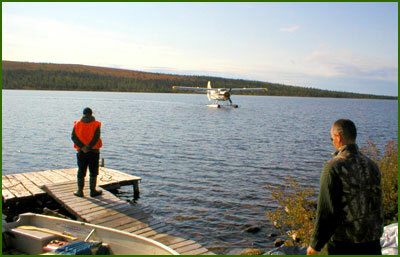 At the beginning of 2005, we chose Jack Hume Adventures (JHA) who works the northernmost areas of Quebec. This outfitter is so successful (and hunter friendly) that you must book a year in advance. We chose the Deluxe Camp ($4300.00), which includes a guide and cook for 6 hunters. Brad and I would be joined by four other active, experienced, and very successful bowhunters. Two are tournament archers, another owns a broadhead company, and one works for a bow-sight manufacturer. Logistics for this hunt are as follows. We would need to travel to Montreal, Canada (our only additional expense) and from there we would contact VNQ transportation who handles all transportation logistics between Montreal and Schefferville, Canada (800 miles north of Montreal) where Jack Hume Headquarters is located. 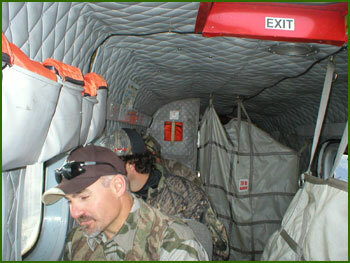 Each hunter arrived at Montreal’s Holiday Inn Airport where we had dinner and discussed our upcoming hunt. The next day, each hunters’ equipment was weighed creating a manifest for the total plane weight. The weight is not so much an issue for the trip between Montreal and Schefferville, but rather for the third and final leg of the trip via bush plane. Weight is critical and we were limited to 65 pounds of gear per passenger. New, lighter weight gear helps considerably here and while challenging, a hunter can bring everything they need within the 65-pound limit - but they must choose wisely. Rising at 6:00am, we met for breakfast before the 2 nd leg of the trip on a turbo prop cargo plane that carried the 40 hunters and their gear to Schefferville. The plane was spacious but not luxurious and the engines were so loud that it was nearly impossible to have a conversation. Upon arriving at the Schefferville airport, we were greeted by Amanda Hume, Richard’s wife. She drove us to JHA Headquarters where licenses were purchased and the last leg of our journey will begin. Anxious to get our hunt started, we were outside and ready for our 7:00am flight. It was quite a morning. The sky was clear, with temperatures around 30 degrees. 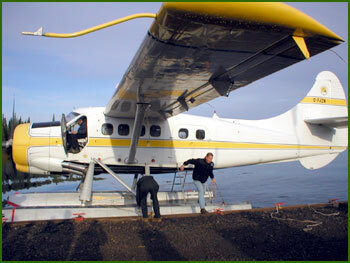 We boarded the De Havilland Otter floatplane for a 150-mile flight to the outer reaches of the Quebec Province. As our gear was being loaded, a wall of fog was entering the lake. It was an incredible sight. We boarded and strapped in. The pilot made two taxi runs up and down the lake before lifting just over the treetops and taking to the sky. Our 2-hour flight was thrilling. All we could see was endless water and tundra. The ground was like a rolling carpet made of lichen. From above it appears as snow, but it is the lifeblood food of Caribou. We made our final approach before dipping to the lake and a perfect water landing. We were greeted by Brian and Cindy - who are married - and will be our guide and cook for this trip. We liked them immediately. Cindy’s job was to cook all of our meals starting with a hearty breakfast each day followed with sandwiches and cookies for lunch. Upon our return there will be a great tasting dinner. Brian’s job is to help us get into position to intercept the Caribou, and if successful, caping, quartering and packing them to camp. Conversations with the previous group of departing hunters described lots of rain and few caribou. But we had brought blue skies and temperatures in the low 50’s so things were already looking up. As the other hunters loaded their gear on the plane and left for Schefferville, we noticed 10 to 15 Caribou across the lake. We assembled our bows and jumped into the boat. At 11:00 am we were bowhunting and among caribou just 3 miles from camp. Our hunt was officially on! We had split into two groups of three hunters. To start the hunt our group began stalking animals from 300 yards away but quickly realized that we’d have to place ourselves in front of them to have any chance at all. Chasing them would be pointless. Caribou seemingly glide across the tundra. They are constantly moving from one horizon to another and no human can catch up to them. At 1:00 pm, while we stopped for lunch, we could see three different groups of Caribou. I Decided to try stalking. While stalking one particular bull, another Caribou came over the rise and was moving in my direction. I took a position behind one of the few short trees. It appeared that the bull would travel thru a small area between my location and a small bush to my right. I ranged the bush, which was 48 yards, and a rock was 35. I nocked an arrow, adjusted my sight and got ready for the shot. It did not take long. The bull had covered the distance within a minute. As he approached, I drew my bow and came to anchor. Appearing in my aperture, I put the pin just behind his shoulder and released the arrow. It hit perfectly with a clean pass thru. The bull bolted and ran just over a rise traveling less than 50 yards before expiring. I stood waiting intently and realized that everything got very quiet. It was all I could do to stay still for the 15 minutes without looking. I eased up the hill very slowly and instantly noticed the horns rising above the ground. Here lay my first ever Caribou! It was 3:00pm. I checked the bull and took the first picture before going to locate Brad. I spotted him, and loudly exclaimed “TA-TONK-KA”. He was impressed. I have a knack for filling a first day tag and that luck continued. It was time to get the load back to the boat loading area. I carried the head and horns and Brad carried two quarters of meat. This should be no problem - we were only 4 miles in. Only it was not flat and downhill. Our original loading area was not in the direction that we wanted to travel so we left for the other boat area. The idea was a good one; but our travel direction was not that good. We managed to walk thru some of the worst terrain on the planet. Navigating tundra with bog mixed with dense spruce. We arrived at the boat around 8:00pm and were informed that Chris had shot a bull as well, earlier in the day. Dinner had been held until our arrival and while enjoyable, we were thoroughly exhausted. Day one ended with success! The only downside from everyone was those terrible man eating Black Flies. Matthew had heated some water for our shower. Taking a shower in freezing temps is, well, quite an experience. The shower wasn’t the problem; it was after the shower that was the problem. You had to towel off in an outside space and walk around the cabin to the heat before turning into a human Popsicle. Day two started early at 5:30 am. The sun was just rising with temperatures in the high 20’s. While eating breakfast we could see a small herd of Caribou moving across the horizon. We gathered our gear and traveled across the lake. This day would prove to be difficult as not many animals were spotted. Dan checked an area that looked like a good funnel while Brad and I moved towards a high ridgeline. Almost immediately we spotted Caribou on the ridge heading for what looked like a crossing. We moved quickly to intercept their travel route. We picked a spot across from some trees. Brad was on the left and I was on the right. The bulls were moving between us. One small bull moved into the clearing not 25 yards away. He wasn’t what I was looking for. Then the biggest of the bulls entered the clearing. He immediately stopped and put his nose into the air. Brad had a 45-yard shot but the angle was poor so he decided to wait. The bull moved to the right of my position. I had checked the range to a small tree and set my Impact Archery Full Draw sight. He continued slowly thru the spot I had picked. I came to full draw, put the sight pin on his shoulder and released the arrow. To my surprise the arrow went over the bull’s back. He was not 45 yards - more like 30. I had missed the bull of a lifetime. He looked both in the direction of the missed arrow and back to where the arrow had come. I had no shot and to my disappointment, he started to move away from us; taking the other bulls with him. Dan had come over a rise and had taken a spot not far away in case we missed. He had no shot. Brad joined us and I had to explain how I had misjudged the distance on the great Caribou. Would I ever get the chance to recover from this mistake? Only time would tell. We gathered together for lunch. As we rested and glassed the surrounding area (about 1 mile in all directions), Brad asked us to look in a NE direction on a hill behind us. There was a white animal. It didn’t take long to realize that we were looking at a terrific and large White Wolf. It was dining on an old Caribou carcass. The rest of the day was spent battling Black Flies as temps warmed up and the wind lied down. At the other group, Matthew scored on a good bull in the aftenoon. This proved to be an exceptional stalk and a perfect shot on the bull. Day two ended at 7:30pm with a newfound respect for our first day success. Day three started with partly cloudy skies and temperatures in the low 30’s. Black Flies were expected and did not disappoint. We started on individual stalks hoping to improve our chances. After several failed stalks, Brad and Dan moved to the location where I had shot my first bull. It was early afternoon when they spotted a group of bulls heading toward the funnel. 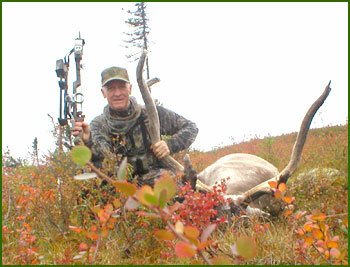 They set up in a small group of trees and when the first Caribou came in range, Brad shot a very nice bull. He traveled less than 50 yards before going down. Dan never got a shot. They quartered and caped the animal then proceeded to the edge of a lake to wash their hands. That is when they noticed another group walking in their direction. Dan had an idea to use the horns of Brad’s bull as a decoy. It worked! A very good bull fed by at 25 yards. Using his longbow, Dan placed a broadhead tipped cedar shaft just behind the bull’s shoulder. The bull reacted immediately by running directly away from Dan and jumping into the lake. I watched the whole scene from a rise 300 yards away. He swam about 50 yards before expiring. This was something that we hadn’t considered before. Would Dan have to swim? After a few moments it was determined that he was floating toward the shoreline. He came within 5 yards of shore. We tied a rock to the end of a string and lassoed the horns before pulling him to shore. We had two bulls down within 50 yards and 20 minutes! After taking pictures of Dan’s Caribou I made a few more unsuccessful stalks before calling it a day. Day 4 started with 28 degrees, cloudy skies and light winds. The winds made it easier to hunt as the black flies were more tolerable. All of us made stalks on animals but no shots until later in the day. Matthew was in position at the top of the trailhead, waiting on animals to move in his direction. He spotted a good bull making his way in Matt’s direction. But it appeared that the bull would not close the distance. Matt moved forward another 20 yards and came to full draw. The bull stopped in a slightly quartering away position. Matthew released the arrow and watched the bull race downhill then out of sight. He followed the blood trail for 100 yards before falling back to wait a little while. 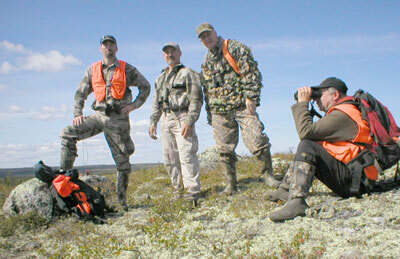 Brian joined him and they took the trail to find the 6 th Caribou dead some 300 yards away. A lethal liver shot had put him down for good only 200 yards from the boat landing. Being the first with 2 Caribou tagged, Matt would be fishing and bear hunting the rest of the week. What a problem to have! Taking care of his 2 nd bull and arriving back at camp still early in the day, Brian showed Matt a bear cache he had spotted earlier in the season. While glassing the cache from camp, a large bear approached. Matt formed a plan to hunting that bear the next day. Day 5 began with overcast skies and light rain and that continued most of the day. Brian came over to our location and helped spot for us until the clouds moved in reducing visibility to 10 feet. At this point, I found a large boulder that would shelter me from the wind and rain allowing me to glass a large area as soon as the clouds lifted. It happened every so often for a short period but it was only temporary. However during one of those brief windows, I spotted several Caribou moving in my direction and decided to move to another vantage spot. Not checking the direction with either my GPS or my compass, I walked about an hour at which point the fog and clouds lifted and I realized I had never seen this area. It was a nice spot littered with small trees. I checked my GPS. I had walked a mile in the wrong direction and 2 miles from my intended destination. I set a course and headed back to where I thought the Caribou might be. I made a few stalks in the thick fog only to arrive where the Caribou were not. 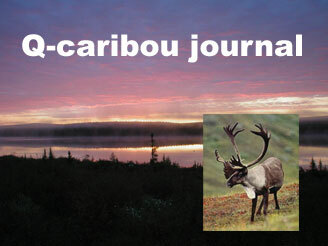 For most of the day Caribou moved thru in groups of 40-50 in each herd. Making stalks in low cloud cover proved to be unsuccessful. Earlier in the day, Matt had taken some bacon grease to the bear cache and had taken a position near the bait. He called on the radio and was talking about the low cloud cover and how spooky the situation had become. Not knowing which direction the bear might travel and being unable to see the cache, he did not stay long and decided to leave the bait to head back to camp. Meanwhile, when the clouds dropped down and the vision evaporated, Brad had moved to the funnel and took up a stand to wait until the weather broke. That move paid huge dividends as Brad shot his #2 bull from 30 yards. Brian and Matt both came with pack frames and helped Brad take his bull back to camp. Day 6 began with Brad and Matthew taking fishing gear and trying to catch our dinner. Dan and I traveled to our trail and headed toward the back of the ridge to get into position for what we hoped would be a short day. Through the early part of the day, I had several blown stalks until late in the afternoon. I heard Dan call and say that he was getting into position on several bedded Caribou just above the trailhead. I started moving in that direction getting as high as possible to use the wind. As I came over the top of the main ridge, Brian came over to tell me to stop immediately! The Caribou were just ahead and not more than 200 yards ahead. I started glassing and spotted several large sets of antlers. I chose a spot 80 yards ahead where there was a small group of trees. I tried to locate Dan and realized he was in position immediately to the front of the group and well hidden. One bull decided to rise, stretch and move closer to Dan’s location only to lie down again. Then 2 more bulls rose and wandered toward Dan. One bull stopped and the other proceeded directly toward Dan. 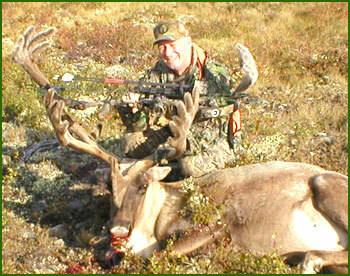 At 25 yards the bull became broadside and Dan placed his arrow perfectly thru the Caribou’s chest. I was in a great spot to witness the Bull Run full tilt for the better part of 60 yards. As he was approaching the 40-yard mark, his head was starting to drop. Then at 50 yards his head was touching the ground. He stumbled and tipped over. This took all of 30 seconds. Dan had a great trophy. As soon as the bull stopped, Dan stood and yelled “TA TONKA!” He was the third to tag a 2nd Caribou. I moved toward Dan and congratulated him on his success. After a few minutes we noticed that the other bulls had stopped to see what the commotion was all about. We crouched over the bull’s shoulder and the other animals started walking in their original direction. I should have stayed in my blind and maybe I would have scored on another great bull. After a few pictures, Dan started to cape his bull and more bulls started coming over the ridge at us. There were another 20 animals in this group and several of the bulls were trophies. I was hoping they would continue on their course but they veered away and walked straight down the ridge. It was time to move to check the funnel for more traveling herds of bulls. It took about 15 minutes to cover the mile and upon arriving, there were 4 good bulls coming directly through the funnel. I started a slow walk back towards the trail head. As I came over a small rise, there were 8 bulls coming in my direction. I immediately dropped out of sight and moved back to the funnel. I took up a position in a small group of trees and waited. It was about 10 minutes before I came out of hiding and realized that the bulls had taken another route. I started glassing the area again and saw 4 bulls traveling towards the funnel from another direction. I checked their travel route and moved as best I could to get in front of their path. They kept coming in my direction a little at a time, crested a small rise about 75 yards away and stopped to check the wind. I used my range finder to check distances on bushes on both sides of my ambush point. The bulls decided their path was ok and started coming right at me. The bull in the rear was the best of the group and I watched him carefully. At first I thought he would come past me on the left, and then they turned and moved a little to the right. At 25 yards they changed and started a path that would put them in my lap. I changed my setup and drew my bow to the left. The first animal passed by me at 20 yards, the next one at 15 yards and the third bull was a mere 10 yards walking slowly. Then the 4 th and final bull came into view at an alarming range of 10 feet. I put my sight pin on his shoulder and released the arrow. It hit him so hard he was practically knocked off his feet. I had pinned his shoulders and he fell over dead as a hammer. I sat down and tried to take into account what I had actually accomplished. It was 3:30pm on the last day. Even though I was about 5 miles from camp, I was elated to have scored on my 2 nd bull. He had to be the oldest and ugliest bull that anyone ever shot. But it did not matter because he was all mine. After some pictures, I walked to the top of the ridge and called for help with packing. Brian and Matt would be on the way. When they arrived, Matt wanted to carry my pack and Brian said that because I had shot my bull so far back on the last day of the hunt that I would carry my own load. We put our cases on our backs and headed toward the landing area. Matt had my rack and I had the meat. At the top of the ridge, I asked to carry my rack to the final landing point. As we came over the crest of the ridge and into view of the other hunters, I gave them a “TA-TONK-KA”. The last hunters decided to hunt until dark before giving up on completing the task of taking 2 Caribou. Tonight we celebrated the completion of the hunt with 9 bulls for 6 bowhunters. To me and all of the other hunters it was the hunt of a lifetime. The Northern Lights, the White Wolf, the huge Black Bear, somewhere between 500 and 750 Caribou (90% bulls), Blue Berries and Cranberries just for the taking along with the most beautiful scenery any of us have ever seen. For dinner, we had grilled Caribou and for dessert Cindy had made us a Blueberry Cake. How she managed such a great meal is beyond our expectations. Tonight after dinner, the clouds started to part and revealed some strange lights in the sky. It looked like the glow from a big city. It was the Northern Lights. They would streak across the sky, retreat and make another formation. It was too early for rich colors but it was definitely a stellar show. We arose to a beautiful sunrise and a slight hint of fog hanging over the lake. The Otter landed gracefully and parked at the dock. After taking pictures and saying good-bye to Brian and Cindy, we loaded our gear and were on our way back to Schefferville. Our flight back was more subdued. Our hunt was at an end. Arriving in Schefferville, we completed our paperwork and rode to the airport for our final trip to Montreal. This flight was also much quieter than the outgoing flight. We were bone tired and slept most of the way. Our last nite in Montreal was spent reliving the hunt. We ate breakfast together and rode to the airport as a group before heading our separate ways. I have been on many guided and unguided hunts throughout my life. A few of these were acceptable and a couple not. Our choice of Jack Hume Adventures was the best decision we made. Not only were all services rendered as proclaimed in the brochure, but Richard, Amanda, Cindy and Brian made this trip exceptional. From the paperwork, transportation, lodging and food there were no surprises. From the moment we booked our hunt to the return trip, we knew exactly what, when and where every situation would occur. That is what I consider a quality outfit. Bill Millican hails from Georgia and is the production manger for Impact Archery, makers of some of the finest quality Bow Sights available.